Unbelievably, I've had this silk J. Crew top for a year and a half now and only worn it twice. I just haven't found anything to wear it with! The top is actually layered, so the second, longer layer is tucked into the skirt. I think it's finally met it's match! I really like how it looks almost peplum-y and the more cropped effect it has. And god, do I even need to say why I love this skirt?? Galaxy is my latest obsession. And this skirt is so wonderfully crafted that it's satisfied my obsession (....for now). Check out mmddyyyy for more galaxy, acid wash, studded and just totally COOL stuff in general! Also, how awesome is that name? I'll admit I didn't get it at first. But now that I do, I see how clever it is! If you're sometimes slow like me, I'll let you in on the secret: mmddyyyy the format for a date! I have less than two weeks now until my preseason starts. It seems so crazy--this summer has gone incredibly fast! I'm excited to go back to school (and have my fall soccer season start) but I'm not excited for the weather to get cold, the days to get shorter, and the homework to start up again. And not enough time to do everything I want to do! Well, I'll soak up these last few weeks as much I can! WOW this is so cool, I see you have a great taste! Maybe you could check out my new outfit? && b'awh! You are too lovely. I haven't ever taken any photography classes or anything, but it is something that I think is fun to do! A hobby, you could say. :D :D awe! And you definitely found the perfect match with the tank. Very pretty, the hits of blue go perfect with the print. Ugh, and I know what you mean about how fast this summer's gone...it's crazy! I still don't believe it. Time flies when you're having fun I guess. I'm a little more excited for this fall/winter since I'm starting college and I do enjoy the layering fashion that pops up around now lol. Other than that...definitely agree with you on everything else. Ahh! This skirt is ridiculously cute. Such a cute way to dress out of the box during these HOT months. Love your skirt!! The print is very very cute! Works well with your necklace! i love everything about this: title of the post and the skirt! 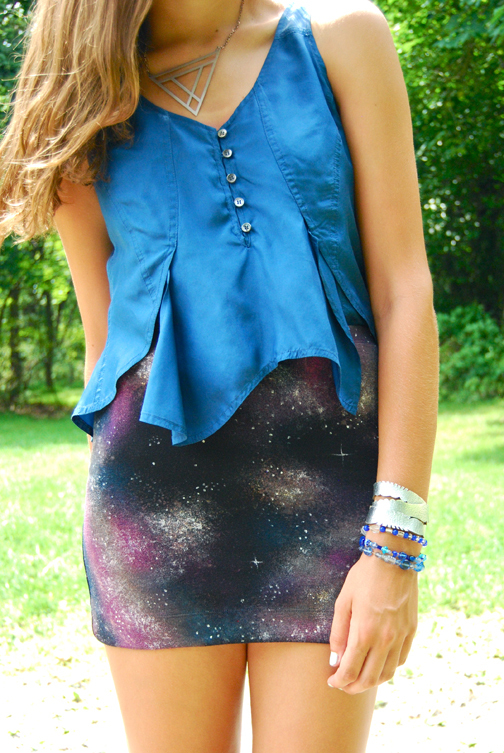 woah that galaxy print skirt looks AHHHHMAZING! I love how you tucked in the second layer of the top to make it look almost peplum-y. You are so creative. And that triangular necklace is so cool :D Yay I just love this outfit. ugh I know right?! Summer just went by soooo fast. I don't want the homework to start piling up -_______- But oooo I am so excited for fall outfits and for the holiday season. Very beautiful skirt... great look! Perfect styling! in love with those shoes! great outfit! That skirt is amazing! you look absolutely cool. Your cute top looks great on you! It matched perfectly with your space print skirt.